Schematic illustration of the three major pathways of allorecognition: direct, indirect, and semidirect. In the direct pathway, donor antigen-presenting cells (APCs) interact directly with recipient T cells. In indirect recognition, recipient APCs present processed donor allogeneic peptides to recipient T cells, similar to more typical immune responses. 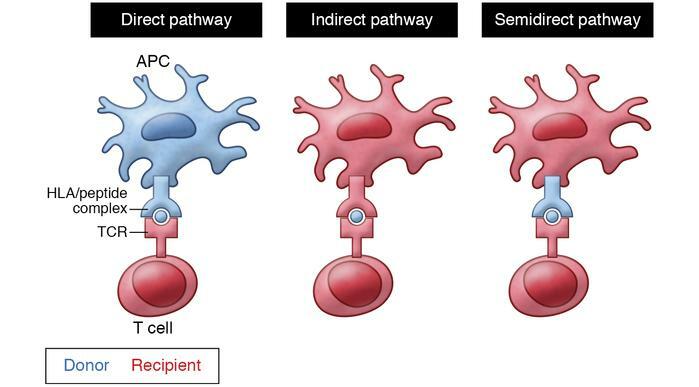 In the semidirect pathway, recipient APCs acquire donor HLA molecules that present peptides directly to recipient T cells.